It’s peak Al to say that he’s looking out for Gaethje’s health by pushing a potential matchup back to late summer. But is the fight actually being discussed? “Little bit”, was all Al would say. It would be a near-perfect matchup for Gaethje, and one fans would have an easy time getting behind. Iaquinta had won five straight before his high-profile decision loss to Khabib Nurmagomedov; Gaethje is on the most exciting two-fight skid in UFC history, coming agonizingly close to beating Dustin Poirier and Eddie Alvarez before going out on his shield in both fights. He needs a step back, but not too far back; someone that keeps him relevant with a win, and doesn’t consign him to the dust-bin with a loss. 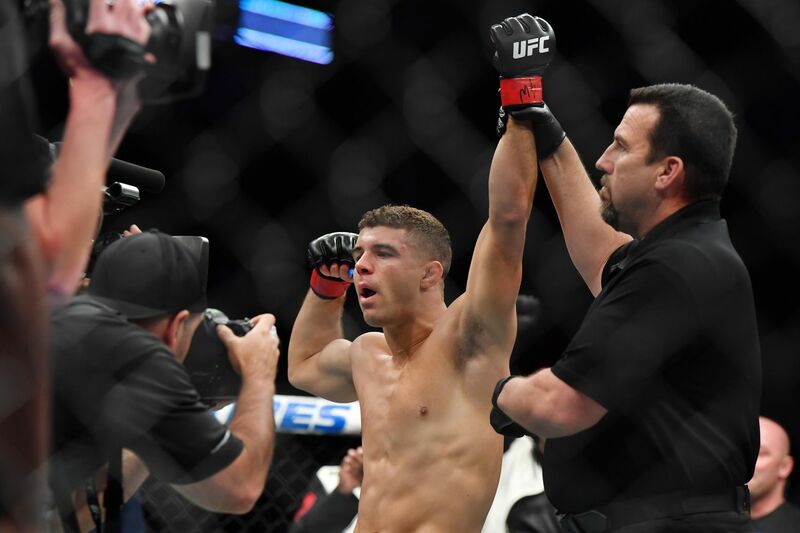 Iaquinta is in a similar space; his short-notice loss to Nurmagomedov may have dampened any title hopes, but he hung tough with the Russian for all five rounds. Both men are known for wanting to throw hands in the pocket in a fan-friendly manner; neither are known for meticulous risk avoidance. Of course, it’s hard to make a bad fight at lightweight; Edson Barboza’s manager has also thrown his hat in the ring for a fight with Gaethje. The guy on the left is your hopes, dreams and ambitions. On the right is you. Joe Rogan loves highlighting very ineffective traditional martial arts techniques. This guy looks like a solid addition to the UFC roster. Look at that combination. By God. Yair Rodriguez explains his side of the story- probably a lot closer to what really went on in negotiations- and from what he said, it’s either a bad call by the UFC or a worrying signal to the rest of the roster that fighters attempting to negotiate what is best for their careers won’t be tolerated. Fab Werdum popped positive the same day his main event slot in Russia was announced. That’s impeccable timing. They don’t call her “Thug” Rose for nothing- Namajunas says she might be interested in giving Jedrzejczyk the rematch, but only if Joanna will admit she is the best. That’s truly superb. Say what you will about Trump, he’s the funniest president we have ever had and likely will ever have. Dominick Cruz has stayed plenty busy in the months since his UFC 207 title loss to Cody Garbrandt, traveling the country in his role as a FOX Sports analyst and even appearing in the UFC broadcast booth as a color announcer during fight nights. But now, after giving his body a break from the rigors of fight camp, Cruz is beginning to turn his gaze back towards his next move in the UFC bantamweight division. And for the former two-time champion — a man who many consider to be the G.O.A.T. of 135 pounds — a shot at the winner of UFC 213’s showdown between Garbrandt and T.J. Dillashaw is precisely what Cruz covets next. “I just had to give my body a little rest from the beatdown from martial arts for a couple of months,” Cruz said Monday on The MMA Hour. “I fought those three fights last year. That’s three title fights against some of the best guys in the world, back-to-back, after the layoff I had. That was a good year for me. I put a lot of work in. And so I took a little bit of time, three or four months I’ve taken to just heal. I’ve been training. I shot stem cells into both of my feet, I shot stem cells into my shoulders, just to make sure I take a second and I marinate and heal. Marinate and rest and just let my body get 100 percent. Cruz, 32, reigned for many years as the king of the bantamweight division, capturing the WEC title in 2010 at a time when the blue cage was synonymous with the best lighter weight talent in the world, then transitioning that title over to the UFC with additional victories over Urijah Faber and Demetrious Johnson. Cruz ultimately vacated his strap due to an unforgiving string of injuries that kept him sidelined for nearly five years, however he returned against all odds and recaptured the belt in 2016 with triumphs over Dillashaw and Faber. So given his many accomplishments in the division, Cruz figures it makes sense for him to get an immediate chance to reclaim what once was his. “I told (UFC matchmaker) Sean Shelby what I wanted to do,” Cruz said. “Sean Shelby is like, ‘well, I don’t know, I don’t know if that’s necessarily…’ He doesn’t know, he’s saying he doesn’t know. I’m saying this is the fight that needs to happen at 135 pounds. I mean, there’s three people in this division that people know, and it’s me, T.J., and Cody. And the reason why you know us three is because I’ve been fighting these two people and I’ve been talking about them and I’ve been building them on FOX and giving them a lot of shine, and I’ve also been bashing on them, too. “But the mixture of the entire thing has built the three of us (up), and I think that between the three of us, we could probably fight for 10 years and always have a good fight. But realistically, that’s the fight that makes sense to me. It doesn’t make sense to go down in the division. I’m the No. 1 contender now, and to fight backwards in the division after the amount of title defenses I’ve had in the past, it doesn’t even resonate or make sense to me. While Cruz edged out Dillashaw in a razor-thin split decision in Jan. 2016, his end-of-year battle against Garbrandt was a much different story. Garbrandt defeated Cruz in a masterful performance that included a pair of knockdowns and a 10-8 fourth round on two judges’ scorecards. So while Cruz would be fine with rematching either of his former foes after UFC 213, he carries a special fire in his heart for a second meeting against Garbrandt. “Realistically, me and T.J.’s fight was very competitive. It was a good fight. I won it fair and square, in my opinion, but I could fight him again and be happy with that,” Cruz said. “But, I lost to Cody. Of course, I’d be lying if I said I didn’t want to fight him immediately, as soon as possible, and get that loss back. In the meantime, Garbrandt and Dillashaw are currently serving as coaches on The Ultimate Fighter 25, and Cruz has had a front row ticket to the Team Alpha Male drama with his role as a broadcaster on FOX Sport 1’s recap show, TUF Talk. Cruz said he believes the mental strain of the contentious situation on TUF 25 will ultimately play in Garbrandt’s favor, although he’s found it interesting watching Garbrandt deal with taking over the lion’s share of promotion that comes with being UFC champion. “This is a game of inches, and every fight you have, every single camp you put in is something your body sees and feels,” Cruz said. “I put in twice the work that Cody did [last] year. That’s in camps and that’s in fights and that’s in media, and that’s in everything in this sport. So, now he’s doing it. When it comes to win/loss records alone, there’s an argument to made that Joanna Jedrzejczyk is already the most successful woman to ever compete in the UFC. The reigning strawweight champion carries a flawless 7-0 Octagon record into her May 13 title defense against Jessica Andrade at UFC 211 — a number that already exceeds the résumé of Ronda Rousey, whose 6-2 UFC run widely popularized the women’s side of the sport, but faded away before it could reach an Anderson Silva or Demetrious Johnson level of sustained excellence. But Rousey is still the standard-bearer for female UFC champions in many regards, and her record of six consecutive UFC title defenses still looms large as the number to beat on the female side of the game. So with the fifth defense of her strawweight strap just around the corner, Jedrzejczyk knows it’s only a matter of time until she makes history by surpassing Rousey, provided she continues her winning ways. The overall UFC title defense record is presently held by Silva, who defended his middleweight belt 10 consecutive times over a 2,457-day reign. However, that record could conceivably be extended by Johnson, the UFC’s current flyweight champion, who will tie Silva at 10 defenses with a victory over Wilson Reis at UFC on FOX 24. Either way, Jedrzejczyk knows she has a long way to go until reaching those dazzling heights. So in the interim, the popular 29-year-old is simply focusing on the fight in front of her, and not overextending herself with personal and professional obligations like Rousey did in the final months of her UFC title reign. “Every fighting career is different,” Jedrzejczyk said. “We all are different. Our lives are different. But the thing is, of course I learned some (from Rousey’s situation), but I’m trying to be smart for myself. There was a time when I could fly to Poland for 10 days, do like seven days of media, I slept like six hours a day, but (coach) Katel (Kubis) was with me and we had amazing times during the training between obligations. But the thing is, it was time for it. Now it’s time to just get ready for the fight. Eight-and-a-half weeks, I will [focus only on] getting ready for UFC 211, and the thing is, no one is going to get my attention. The philosophy is likely a good one to embrace heading into UFC 211, considering that Jedrzejczyk has a formidable challenge waiting for her in Andrade, a hard-hitting 25-year-old who has run roughshod over the UFC strawweight division since moving down from 135 pounds. Andrade is a perfect 3-0 at her new weight, with a trio of dominant performances over Jessica Penne, Joanne Calderwood, and Angela Hill surging her into the top-five of the UFC’s media-generated rankings. Andrade has also not been shy about lobbing a few shots at Jedrzejczyk through the media, consistently criticizing the Polish champion for having a weak chin and vowing to knock her out. But Jedrzejczyk isn’t buying what Andrade is selling. Jedrzejczyk said the trash talk from Andrade is more surprising than usual simply because of the friendly relationship the two women shared prior to UFC 211, as well as the fact that Andrade is represented by Jedrzejczyk’s former manager, Tiago Okamura. “I don’t know what Jessica is talking about,” Jedrzejczyk said. “I don’t know if Tiago is doing this, because Tiago was like a brother to me, and we’re still in good relations. I believe they can get more crazy because of the promotion and she has nothing to lose, but the thing is, I’m still good with them so I don’t know why they go crazy. … I know that Jessica’s English is not so good, so I know that there is someone behind her back helping her with that. It might be Tiago, so I feel sorry for that. We are in good relations, so you’re honest or you’re fake.